Is there a discussion group for small simple systems somewhere? in a row? Pfffft.... I'm just trying to keep my ducks ALIVE!!! There are several threads related to aquarium-based systems. You could either start a thread specifically to talk about small system things or if you have ideas or questions specific to what you are trying on your system then just start a Member's thread and post away! had a day off and made good use of it.. worked on a small setup today. will be about 15 gals total. 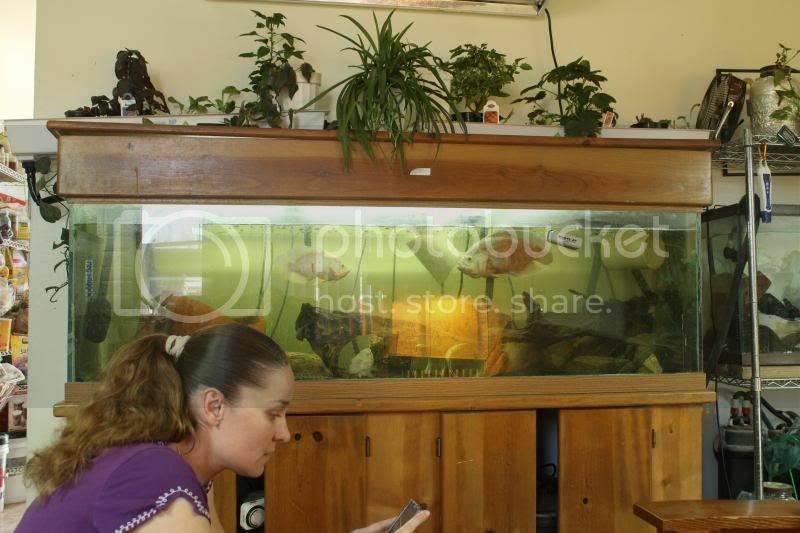 something to put on the porch to watch the fish swim around and grow a few small herb plants. I had most of the material laying around the house. I put 2 tubes on top of the tank and drilled out 9 holes for 2" mesh pots. waiting for the glue to dry now on the supports but will water test everything tomorrow. have to finish installing the fill and drain tubes also. Introduction to what I call "Aquapods"
These "Aquapods" are used side-mount fiberglass bead filters. We cut them in half to make a 1:1 fish tank:growbed ratio. They run on air-lift alone. 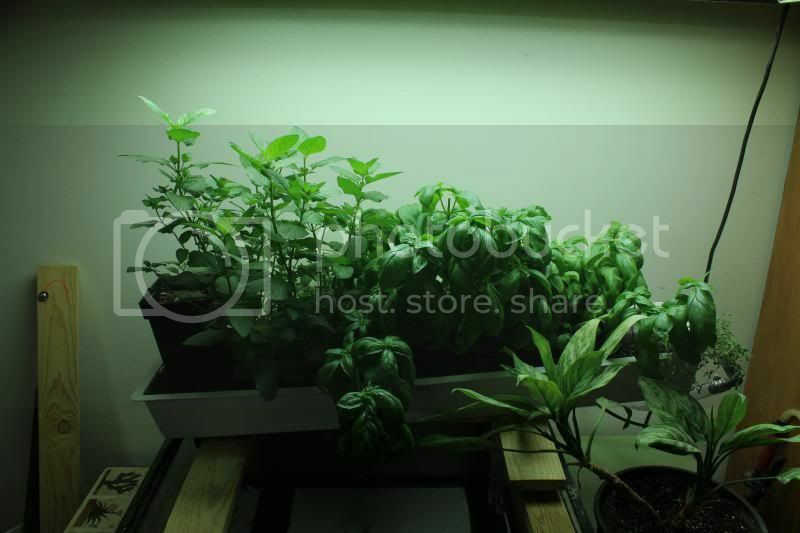 Air is pumped to the bottom of the fish tank through a stone diffuser (diffuser tubing also works) and is lifted up and over to the growbed side. The airlift moves 5-10 gpm of water. There is a gravel bed filter at the bottom of the fish tank. The air lift aerates/degasses at the same time. Water circulation is continuous, and at the grow bed it can be split to each plant or can be dumped straight into the grow bed. 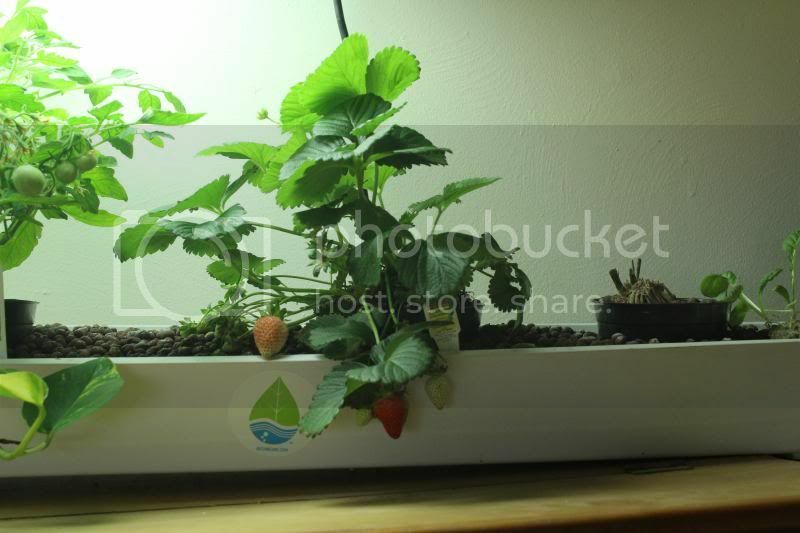 The water seems to distribute fairly evenly through the grow bed with either method of input. We use worms in the grow bed also. File comment: Aquapod with windmill air pump system/15 watt air pump hybrid pumping system pushing ~ .5cfm of air. More volume is pumped when the wind blows.. I put together a barrelponics system about 6 months ago. Got the barrels for free, one bag of hydrotron was about $35, the pump (small one with 10m lead from Masters) was about $39, and a couple of PVC and irrigation fittings for the stand pipe (less than $10). Currently powered by 6 gold fish (actually "feeder fish" brought from the local reptile shop for a couple of bucks) and currently growing a tomato that self-seeded in my soil bed, celery, spinach, and a newly-planted bok choi……everything seems pretty happy at the moment!!! I have a 125 gal Aquarium completely filtered by herbs and vegetables. The fish populating these tanks range from 2 Oscars, White Nile tilapia, African cichlids I use no additional fertilizers of any kind. I do have T-5 fluorescent grow lights helping make this possible. I have 2 42x8x4 Botanicare flood tables over my 125 . The 125 needs more light . This system has been in place for about 2 weeks now. I bought organic heirloom plants that were already about 6 inches and set them up in the trays. I needed immediate filtration so I was unable to start from seeds. The tanks were up and running for several years prior to initiating this system. I would also like to publicly declare that I am by no means an expert. I have kept fish for 30 years and have almost always been involved in gardening of some kind but it has always just been a hobby for what thats worth. My 125 gal system run 15 min on and 15 off 24/7. Not perfect but I didnt have the $80 for a dedicated nft timer. 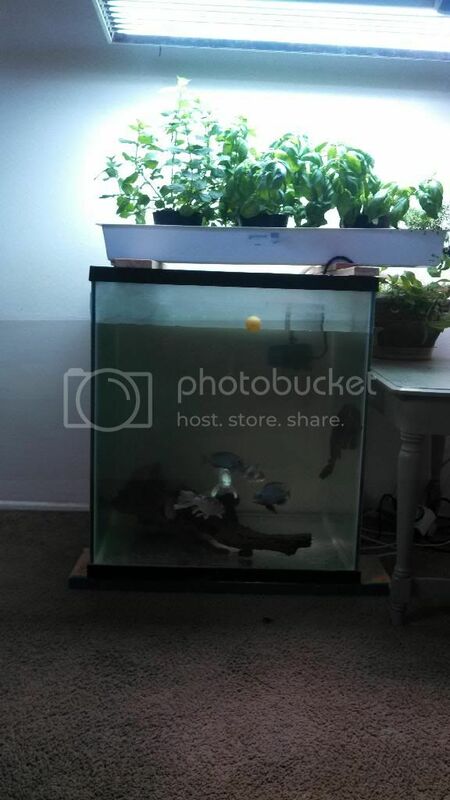 I have a 90 gal aquarium completely filtered by herbs and vegetables. The fish populating these tanks range from White Nile tilapia, African cichlids and 3 small turtles as well. I use no additional fertilizers of any kind. I do have 2 T-5 fluorescent grow lights helping make this possible. I have a 42x8x4 Botanicare flood table over my 90. It needs more trays of plants for filtration. This system has been in place for about 3 weeks now. I bought organic heirloom plants that were already about 6 inches and set them up in the trays. I needed immediate filtration so I was unable to start from seeds. The tanks were up and running for several years prior to initiating this system. My 90 system pumps for 1 min and is idle for 4. That cycle repeats 24/7 This one does have the NFT timer. Roots growing out the drain on day 19! Video update on the 90. I have nearly completed my aquaponics system and have run into a small problem. The clay balls im using continue to fall out the top each time the water fills the grow bed? What and I doing wrong? 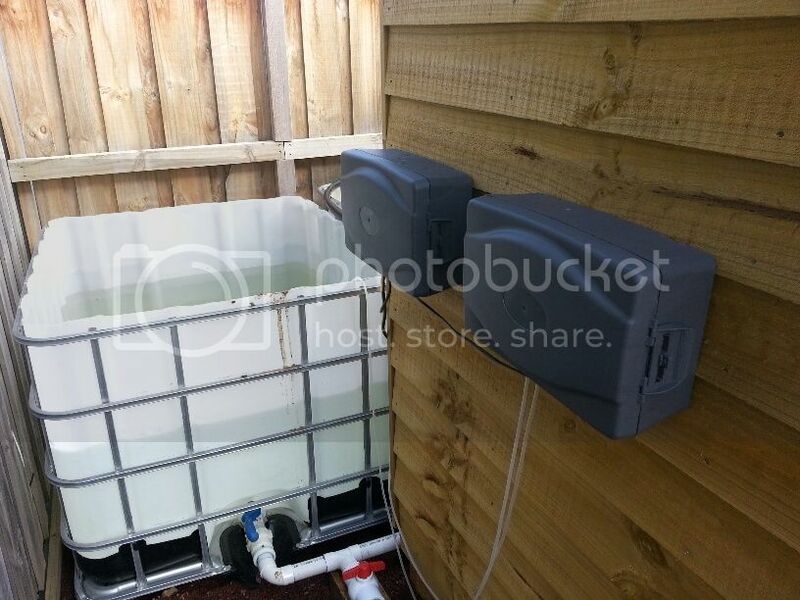 The Growbed is 250ltrs and the two ibc tanks are connected so I can have a pair of goldfish to breed in one and rainbow trout in the other. The pump is 3000 ltr per hour which I have on a tap so the grow bed fills around 4 times an hour and empties through a bell syphon. 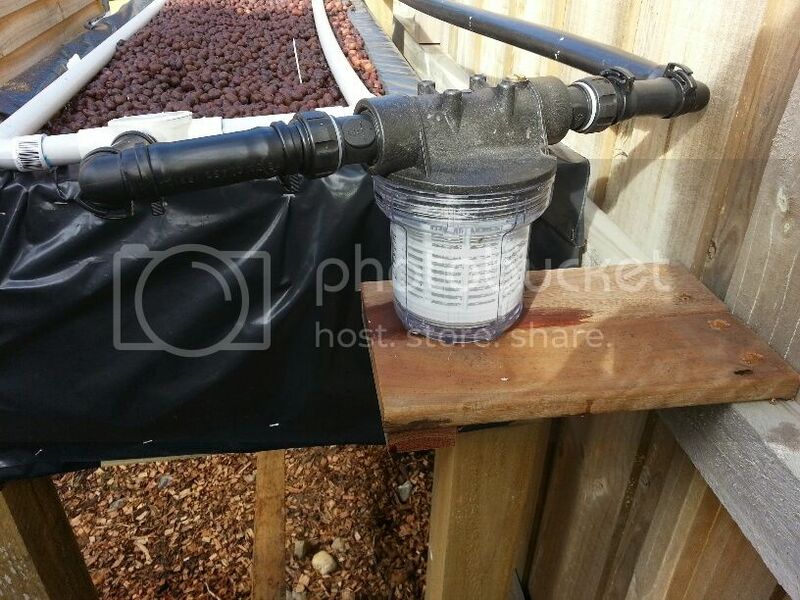 Finally there is a water tank solids filter attached (they are only $19 at bunnings). I have put a few veggies in on the weekend and emptied the pond filter water into the grow bed for the bacteria to cycle the system. I will add fish when the water is tested and safe. I have just checked on the snow peas and lettuce I planted on the weekend and found the clay balls have moved around so much that the plants have sunk under the clay balls. What am I doing wrong? How high is your water level? 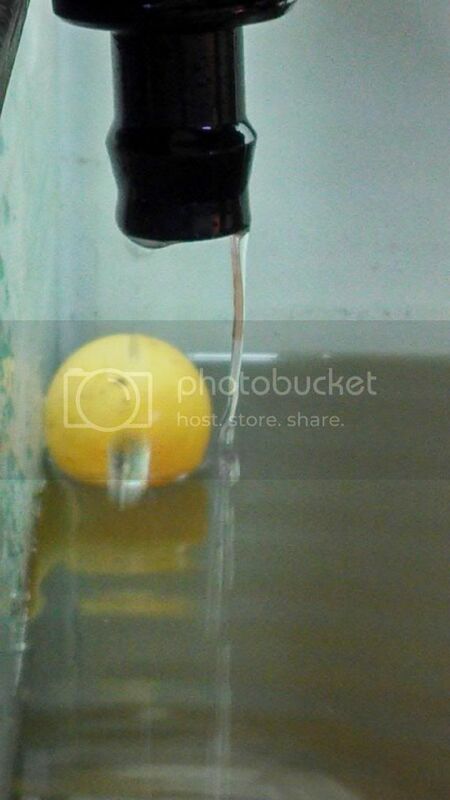 Clay balls tend to float initially. They lose this tendency over time but it does sound like the water level is too deep as Columnmn implied and the clay is just floating so it's free to move about. Probably should start a system thread and we can request that the moderators move some of this information out of the systems thread. I thought it might be a water level issue. The water fills to around 1 inch from the top. I'll cut the pipe down and see how I go. If I have further issues I will post in the systems thread. I am new to AP and have been doing much research over the last few months. My 6yr old and I just finished building our first setup last weekend. It took us two days with design and actual build. This is actually in our living room. 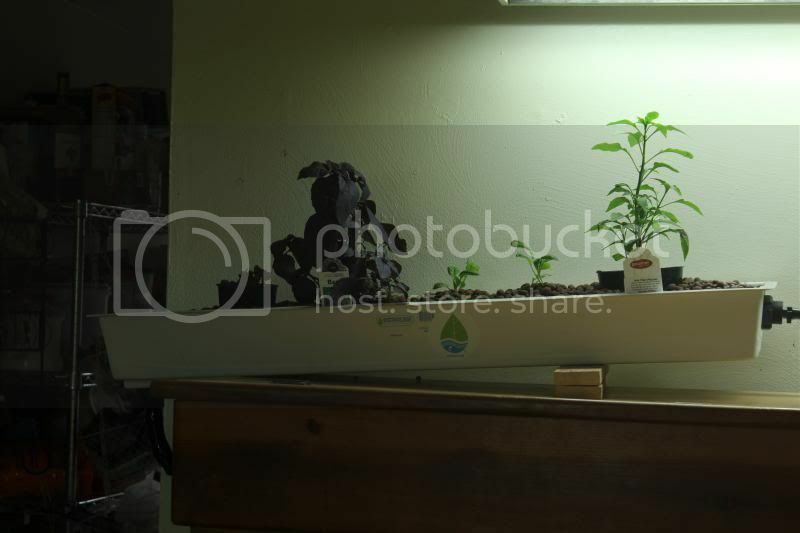 It is a small set up for kitchen herbs. It is half 3/4" river rock and half clay pebbles for media. The system is being cycled with goldfish we got for little to nothing. It has been running for three days now and has some promise. We actually have some celery from the fridge regrowing in it and it is coming up fast. I will create a thread and have more info on it. Thanks for reading and happy farming. Here is my first day and my first aquaponic system. I went for a 1 barrel system to see how it all goes. I cut 200mm off the top of a 44 gallon blue barrel and turned it over for a grow bed. I had a 1100 gph bilge pump so am using that and powering it from an old atx computer supply through a timer set to 15 mins on and 45 mins off. 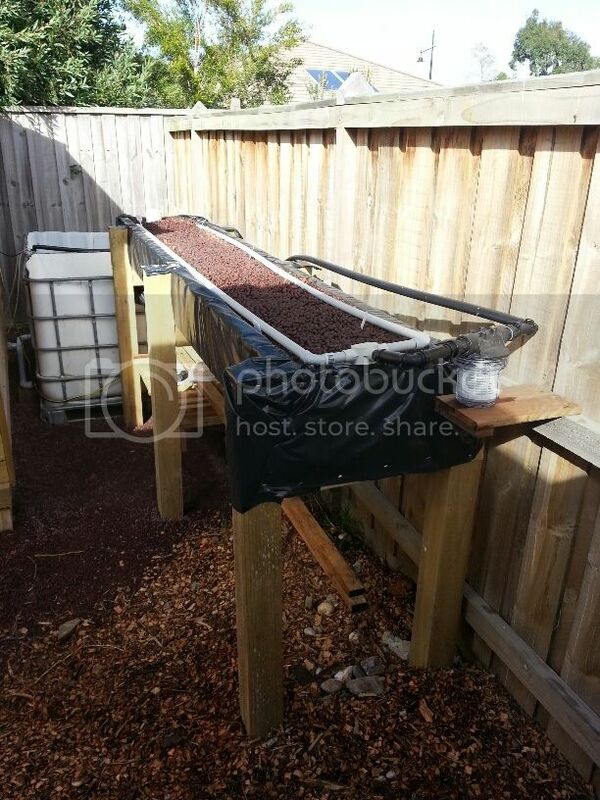 I bought some river pebbles and set the system up with a bell siphon to drain the bed. I will buy some seedlings tomorrow and some gold fish next week. I stuck a shrub in that has been on our lawn for a year with no water and still has leaves on it ( I don't know how either ). I think it can't be killed so we'll see what happens.